Google's Android mobile operating system is finally picking up a little steam, according to a recent survey. ChangeWave Research polled over 4,000 consumers in mid-December and found that 4 percent of respondents who own a smartphone now use Android—that’s up from a measly 1 percent in the previous September 2009 survey. While even 4 percent doesn’t sound particularly encouraging for Google, the survey also shows that 21 percent of those who planned to buy a smartphone in the next 90 days said they’re looking to get on the Android bandwagon. That reflects a 15 percent increase since the previous survey. All in all, the survey results may not represent a dramatic change in the annals of consumer behavior. Still, on the eve of what may be Google’s launch of a branded phone of its own, the sentiment shift may be a harbinger of new competition in the smartphone field. 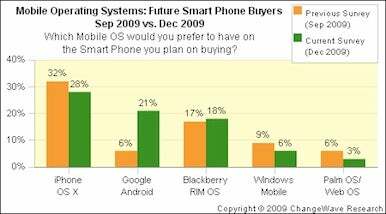 In the fall of 2009, Android was tied for last place in terms of consumer preference; it’s now leaped to second place. More specifically among Android handsets, the Motorola Droid has seen the biggest jump in future buying (now winning the hearts of 13 percent of those potential buyers). The iPhone OS remains the leader, though, with 32 percent of respondents saying they’ll go with Apple for their upcoming smartphone purchase (that is, however, slightly down from 36 percent back in September). If you’re interested in overall current ownership and not future buying, you should know that 42 percent of people surveyed already own some kind of smart phone. Research in Motion leads this pack with a 39 percent share while Apple holds a respectable 31 percent. Concurring with other surveys, ChangeWave shows that Apple claims the top spot when it comes to customer satisfaction: a heady 77 percent of iPhone users are very satisfied with their current cell phone. That compares with 72 percent for Android OS, 41 percent for RIM OS, 33 percent for Palm OS, and 25 percent for Windows mobile.